Natalie Lonsdale is a former Early Childhood Educator who is currently studying to be a Library Technician. Natalie loves children's literature, photography, travelling, history, and eucalyptus trees. Boondaburra is Natalie's first book, and she is working on several more. Natalie has a heart to write stories that encourage children to delight in God's word and in His love. Boondaburra is sad. Why do the other animals make fun of him just because he is different?When tragedy strikes in the Australian bush, Boondaburra learns that being unique has its advantages. 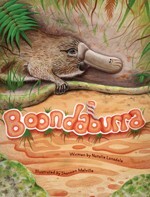 Boondaburra is the story of a platypus' journey from rejection to accepting and understanding his uniqueness, and the friends who come to accept and admire those differences. Boondaburra is a gentle-natured little platypus who loves swimming in the billabong. Many of the other animals make mean and cutting remarks about his physical appearance and he can't help shedding a few tears. But Boondaburra has a wise mother who explains that the Creator surely made them unique for a special purpose. One day, during a raging bushfire, he finds himself in the position where he needs to use his features to be a hero. I've come across many other stories aimed to help children cope with the effects of teasing and this is one of my favourites. The illustrations are so poignant, cute and accurate. I love how the sensitive theme is all tied in with some excellent background knowledge about Australian flora and fauna. Great teamwork by Natalie Lonsdale and Shannon Melville. I hope Kindy and Junior Primary School teachers all across the country use it for story times.